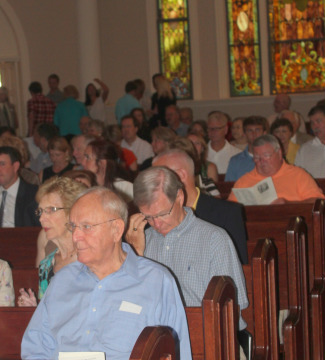 We gather at 11:00 a.m. a traditional service is held in our historic sanctuary at the corner of Academy St. and McLelland Ave.
Order of Worship: The services follow a traditional Presbyterian order of worship. We seek to be faithful to Scripture and the Reformed tradition while embracing the best of contemporary insights on worship. Preaching: Sermons are rooted in Scripture. The sermon’s Scripture passage and outline are available in the bulletin. A children’s sermon is shared every Sunday as a means of communicating God’s love and grace with young ones. Music: Our full-time Director of Music leads a fully developed music program of adult and children’s choirs, occasional orchestra, youth and adult handbell choirs. 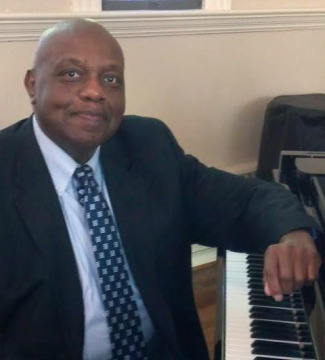 The sanctuary instruments include a two manual Reuter pipe organ and a Yamaha grand piano, helping to provide musical support for worship. Our Chancel Choir sings each Sunday and children's choirs and handbell choirs participate monthly. Prayer: We pray to the Lord in a variety of ways and for a variety of concerns. 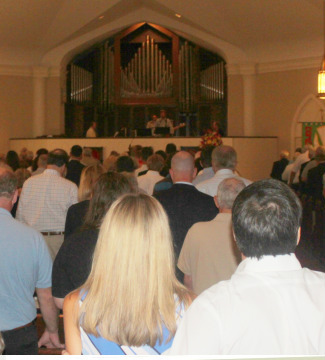 We use unison prayer, free prayer, and silent prayer in our services. A prayer list of concerns is included in every worship bulletin. The Sacraments: We celebrate the Lord’s Supper several times a year, most often on significant Sundays such as the First Sunday of Advent, Epiphany Sunday, the First Sunday in Lent, Maundy Thursday, World Communion Sunday, and Reformation Sunday. Baptisms are scheduled through the church office in consultation with the pastors. Child Care and Other Needs: We provide child care for infants, toddlers, and preschoolers during all worship services. First graders through fifth grade children are invited to participate in First Kids’ Worship following the Time With The Children. The service is designed as an age-appropriate worship service for elementary age children and is held in the fellowship hall; parents will pick their children up in the fellowship hall. Handicapped parking is located behind the educational building (entrance on Broad St.). 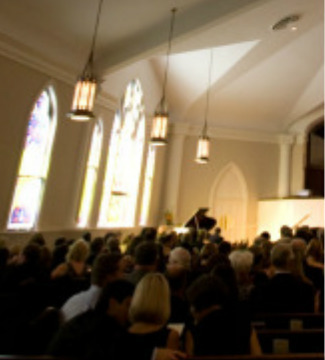 Discrete hearing assistance is available throughout the sanctuary.